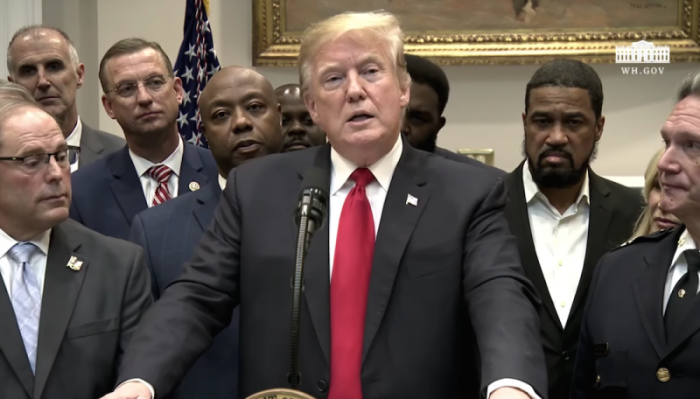 President Donald Trump officially announced his support for a prison reform bill called the FIRST STEP Act, and hailed pastors such as Paula White for fighting for it. "Today, I'm thrilled to announce my support for this bipartisan bill that will make our communities safer and give former inmates a second chance at life after they have served their time. So important," Trump said at the White House on Wednesday while surrounded by bipartisan leaders backing the bill. "We're all better off when former inmates can receive and re-enter society as law-abiding, productive citizens. And thanks to our booming economy, they now have a chance at more opportunities than they've ever had before. It is true. Our economy is so strong, that when people are getting out of jail, they're actually able to find jobs," the president continued. "And I have three instances of companies that hired people coming out of prison, and they are so thrilled by the performance of these people. And now they're doing it more and more and more. And a lot of people are seeing this. It's great." The FIRST STEP Act aims to reduce the federal recidivism rate by expanding training and educational programs that are helping inmates prepare for life outside of prison. Moreover, it would open up the door for eligible inmates to earn time credits to complete their sentences in halfway homes or in-home confinement. The bill also seeks to ban the shackling of pregnant inmates in labor, and to place a 500-mile limit on how far inmates can be incarcerated from their families. The legislation has stalled in the Senate after it passed the House of Representatives by a 360-59 vote. The latest developments indicate that Senate leadership has now reached an agreement on language in the legislation with the White House. Supporters of the bill, including black pastors who have met with Trump to discuss its benefits, had been hoping to secure the president's backing, which they now have, as he vowed to sign the document when presented before him. In his speech on Wednesday, Trump made special mention of his spiritual adviser, Paula White-Cain, who leads New Destiny Christian Center in Florida. When talking about the incentives for prisoners, he said that they include "vocational training, educational coursework, and faith-based programs. And I want to thank Paula White, very much, because I know you very much wanted that — thank you, Paula — that reduce their chances of recidivism, and, in other words, reduce their chances of going back to prison substantially." Trump said that his administration has worked closely with law enforcement regarding the legislation, ensuring that it will remain "tough on crime" and support the "tremendous work of our police and the tremendous job that law enforcement does throughout our country." "We're honored that seven of the major police organizations, including the Fraternal Order of Police and the International Association of Police Chiefs, have fully endorsed this bill," he pointed out. White revealed on Twitter that more than 2,000 evangelical pastors signed a letter in support of the FIRST STEP Act, calling it "the most significant effort at criminal justice reform to be passed in a generation." Trump referenced the letter and said that the faith community in America has shown "unbelievable support" for the bill. "Americans from across the political spectrum can unite around prison reform legislation that will reduce crime while giving our fellow citizens a chance at redemption. So if something happens and they make a mistake, they get a second chance at life," he noted. "Today's announcement shows that true bipartisanship is possible. And maybe it'll be thriving, if we're going to get something done. When Republicans and Democrats talk, debate, and seek common ground, we can achieve breakthroughs that move our country forward and deliver for our citizens." Major faith-based nonprofits serving prisoners and their families, such as Prison Fellowship, said that the agreement between Trump and the Senate is crucial. "Prison Fellowship applauds the President and the members of the Senate and House for reaching this agreement and taking a substantial step forward for justice," said James Ackerman, president and CEO of Prison Fellowship. "Now it is critical for Members of the Senate to act in a swift manner to pass this amended bill." Craig DeRoche, senior vice president of Advocacy and Public Policy, commented, "A vote against this bill is a vote against public safety, religious liberty, and our deeply held belief in redemption. "This legislation will help people transform their behavior and lives while they are incarcerated and this will make our communities safer, lead to more success and less crime. Prison Fellowship believes this bill can pass with an overwhelming bipartisan vote and that the enactment of the FIRST STEP Act will pave the way for more values-driven reforms to come." Heather Rice-Minus, vice president of government affairs for Prison Fellowship, previously told The Christian Post that Trump's relationship with the faith community and his meetings with pastors on the issue have played a big part in securing his support for the initiative. "Having him hear from those pastors and know that he would have the ability to impact some of their communities I am sure was in the front of his mind going into the meeting with Sen. [Chuck] Grassley and others who wanted to see a broader approach to justice reform," Rice-Minus told CP in August.